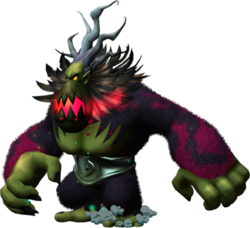 Ghastly King is the main antagonist of Donkey Kong Jungle Beat. He first appears as Cactus King in the game, although their shared appearance and Japanese name indicates that they are the same being. Before reaching him, Donkey Kong must go through a wooded hollow. Once he enters the King's lair, Donkey Kong sees Cactus King on Boss Pig Poppo. Once the battle begins, Boss Pig Poppo begins to breathe out fire. Donkey Kong must clap at the fire until he can approach Boss Pig Poppo and stun it, allowing him to attack it. Once Donkey Kong has landed enough blows on Boss Pig Poppo, Cactus King will jump and crush it. Donkey Kong must fight Cactus King by wall jumping at him, swinging his legs, or knocking him forward. If he is knocked down, the player can pound on him. During the second fight however, the level is much harder. The new attacks include the ability to spit balls of energy out of his mouth at Donkey Kong, as well as being able to kick him in midair. However, the balls can be destroyed by using the Sound Wave Attack. Like the other bosses, Ghastly King has 500 HP in both fights. He can be attacked by either encountering him face to face, or by throwing him into the walls, which momentarily knocks him out and allows the player to punch him. If the player attacks him face to face, Ghastly King attacks Donkey Kong with a backhand slap, throwing him into the wall. If Ghastly is attacked enough times, he flies into the wall and is momentarily knocked out. When Ghastly King is defeated both times, Donkey Kong receives 800 beats. Italian Egemone Hegemon, someone who has the control on everyone. It is also similar to the word "demone" (demon). At the very beginning of both fights against Ghastly King, there is an arrangement of the song that plays when Donkey Kong is climbing up the construction site in the original Donkey Kong. He appears as an unused model under the name BlackMistCreature in Super Mario Galaxy, missing all but his "action" animation directory from Donkey Kong Jungle Beat. This page was last edited on January 29, 2019, at 12:56.